Village Take Away House uses their own specialised couriers to deliver their food. Give your taste buds a treat with our exclusively rich kebabs which come with lettuce, tomato, onion and carrot. With lettuce, tomato , onion , carrot and cheese and 2 free sauces. Small (2 eggs), Large (3 eggs). 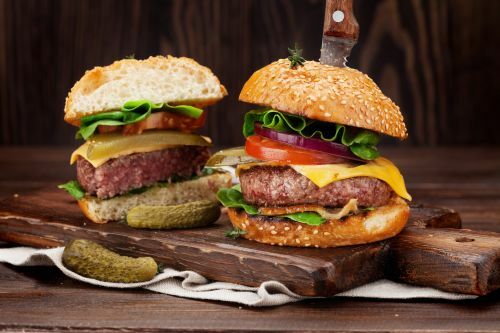 Our delicious burgers will leave you craving for more! Falafel, cheese, lettuce, tomato, onion, garlic and yogurt sauce. Beef, cheese, lettuce, tomato, onion and BBQ and aioli sauce. Chicken, cheese, lettuce, tomato, onion, BBQ and aioli sauce. Fish fillet, lettuce, tomato, onion and tartare sauce. Beef, cheese, bacon, egg, lettuce, tomato, onion , beetroot, pineapple and BBQ and aioli sauce. Our wide range of pizzas are sure to please the pizza connoisseurs! Treat yourself with our Aussie crumbed or grilled fish and chips meals! 2 x Prawn Cutlets, 2 x Seafood Stick, 4 x Calamari Rings, 2 x Fish Fillet, 1 x Large Chips and 2 x Can of Soft Drink. 4 x Prawn Cutlets, 4 x Seafood Stick, 4 x Calamari Rings, 4 x Fish Fillet, 1 x Mega Chips and 1 x 1.25L of Soft Drink.